The Witcher 3: Wild Hunt rocked E3 and will be available DRM-free on GOG! As every Friday, this one also brings a new episode of This Week on GOG, our short video guide to recent events, promos, and other happenings on the site. We know you like the show (or you feed us with sweet lies in the comments to make us feel better about ourselves), so if you haven't already, you might want to follow the GOG.com channel on Youtube, so you won't miss our shows, specials, and exclusive trailers. This particular episode may not sound the way it usually does. That's because the voice-over recording wasn't done in a studio. Oh, no sir! The Enigmatic T had to improvise and, under the circumstances, he did pretty well. If you want to see the details, as well as some photo footage from GOG.com/CD Projekt RED Gaming BBQ and E3 itself, head to instagram.com/instaGOGram, our new Instagram photo feed we heartily recommend you to subscribe. 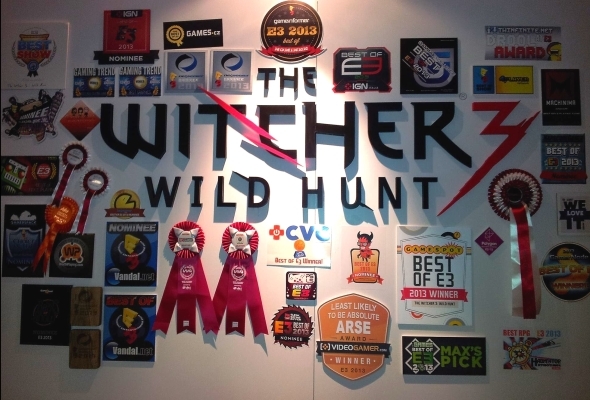 Speaking of E3, our friends at CD Projekt RED are getting people very excited with the upcoming Witcher 3: Wild Hunt. Just look at the accolades their game gathered over the course of the show! We're very happy to confirm that GOG.com will be the source for DRM-free version of the game bringing the story of Geralt of Rivia to a conclusion. While Witcher 3: Wild Hunt will be available to gamers regardless of their gaming platform of choice, CD Projekt RED and GOG.com will ensure as always the availability of the game's version without the DRM on the PCs. We're very proud to announce that among all the above, CD Projekt RED's upcoming RPG epic, The Witcher 3: Wild Hunt, won IGN's People's Choice Award by collecting the highest number of votes among the users. Best game of the entire show? Impressive! See IGN handing the award to Marek Ziemak, CD Projekt RED's gameplay producer and Marcin Iwiński, the CEO and the studio's Co-Founder. Congrats, CD Projekt RED! We're so very happy for your success, here at GOG.com. Now please hurry up with the game, we want to sell it already! That's it from us today, dear users. Check out our nice Notable Nordic Games promo, and have a fantastic weekend! 2013 #noDRM Summer Sale begins on GOG.com!